Shrubs or small trees dioecious, to 4 m (if trees, to 10 m), multistemmed, decumbent or rarely upright; crown generally depressed. Bark brown, fibrous, exfoliating in thin strips, that of small branchlets (5--10 mm diam.) smooth, that of larger branchlets exfoliating in strips and plates. 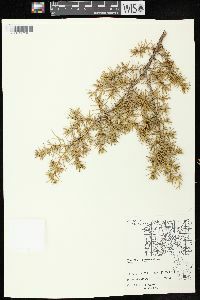 Branches spreading or ascending; branchlets erect, terete. Leaves green but sometimes appearing silver when glaucous, spreading, abaxial glands very elongate; adaxial surface with glaucous stomatal band; apex acute to obtuse, mucronate. Seed cones maturing in 2 years, of 2 distinct sizes, with straight peduncles, globose to ovoid, 6--13 mm, bluish black, glaucous, resinous to obscurely woody, with 2--3 seeds. Seeds 4--5 mm. 2 n = 22. 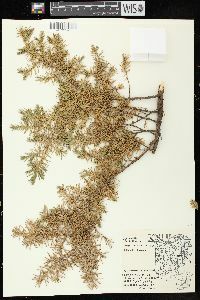 Juniperus communis is the most widespread juniper species, and many subspecies and varieties have been described. A major study, including chemical characters, is needed to clarify the taxonomy. J. D. A. Franco (1962) recognized four subspecies (here considered varieties); two of these---var. communis and var. 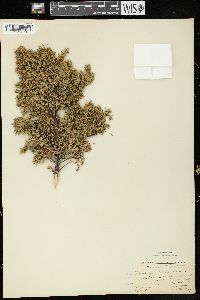 hemisphaerica (J. Presl & C. Presl) Parlatore---do not occur in the flora and a fifth, recognized here, was not treated by Franco. 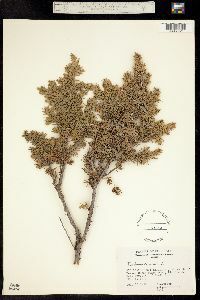 The seed cones of Juniperus communis are used to flavor gin. 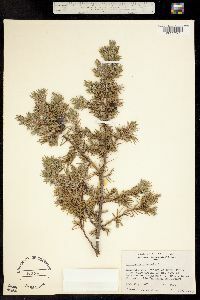 Plant: shrub; decumbent or rarely upright, mostly less than 1(-4) m tall; usually dioecious; bark red-brown, peeling in papery sheets Leaves: usually tricussate, sub-erect to spreading, awl- or needle-like, jointed to decurrent nongreen base Cones: POLLEN CONES axillary, 4-5 mm long; SEED CONES axillary, 5-13 mm long, more or less spheric, red, maturing bright blue to blue-black in second to usually third year, resinous, often obscurely woody Fruit: SEEDS (1-)2-3 per cone, 2-5 mm long, ovoid, acute, usually 3-angled REFERENCES: Bartel, Jim A. 1994. 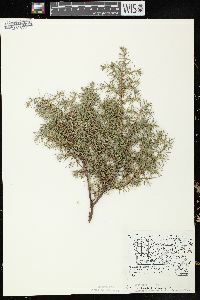 Cupressaceae. J. Ariz. - Nev. Acad. Sci. Volume 27, 195-200. Shrub, occasionally a small tree 3 - 7 m tall, trunk 10 - 30 cm in diameter Leaves: in whorls of three, needle-like, often with a white line above, shiny dark green beneath, 0.6 - 1.8 cm long with a sharply pointed tip, almost perpendicular to the stem, holding for three years. Leaves turn yellow to brownish green in winter. Bark: dark reddish brown, peeling in long, loose scales. Twigs: shiny greenish yellow, becoming reddish brown. Form: conical to open and irregular. Cones: unisexual, with separate pollen and seed cones produced on different plants (dioecious). Pollen cones: 4 - 5 mm long, widest at base. Seed cones: almost spherical with three to four scales fusing to become berry-like, blue to almost black with a waxy whitish coating (glaucous), 6 - 13 mm across, nearly spherical, each containing one to three egg-shaped seeds. 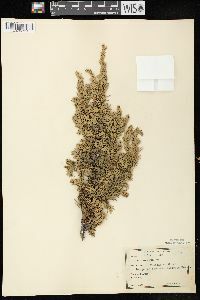 Seeds are 2 - 3 mm long, typically three-angled, and take three years to mature. Pollination occurs from late April to early June. 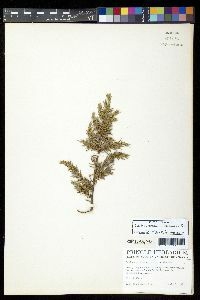 Similar species: Thuja occidentalis is easily distinguished from the junipers found in the Chicago Region. 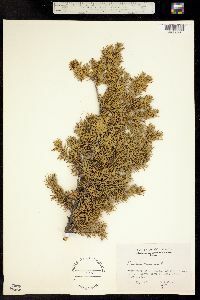 It has flattened branches, all scale-like leaves, and woody cones. 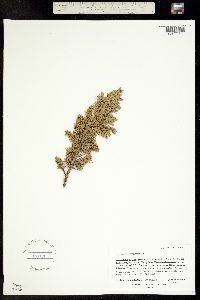 The junipers of the region all have berry-like cones and branches that are not flattened. 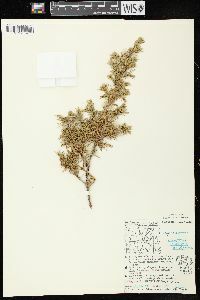 Juniperus horizontalis is trailing with erect branches, has mostly scale-like leaves, and the cones are on recurved stalks. 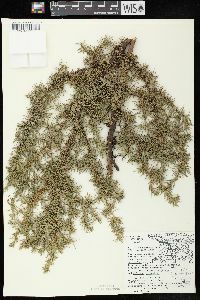 Juniperus virginiana is a tree with both scale-like and needle-like leaves and cones on short, straight stalks. 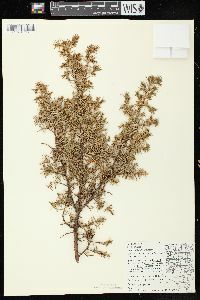 Juniperus communis var. depressa is a trailing form with erect branch tips. 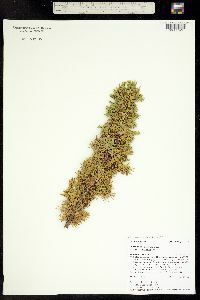 Habitat and ecology: Grows in poor soil, typically on old foredunes near Lake Michigan. 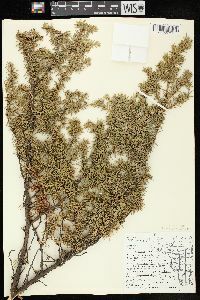 Notes: Juniperus communis is the most widely distributed conifer in the world. It is found in many parts of Europe, Asia, and North America. The seed cones are used as a diuretic or as a flavoring in gin. 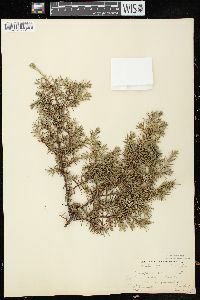 Etymology: Juniperus is the Latin name for juniper. Communis comes from the Latin word for common. General: Evergreen shrub, 0.3-3 m (1-10 ft) tall, ours rarely exceed 1 m; stems solitary or several, growing prostrate to somewhat upright and forming large circular mats;crown generally flattened; twigs 3-angled, yellowish. 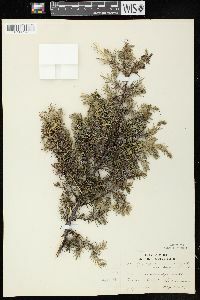 Reddish brown to dark brown, fibrous, shedding in thin strips on small branches and in thicker strips and plates on larger diameter branches. Needles: Whorls of 3, awl-shaped, stiff, spreading to ascending, 3-15 mm long, 1.6 mm wide, green to yellowish green, usually marked with a broad white line on the adaxial (inner) surface, apex acute, often tipped with a sharp point. Cones: Male and female cones borne on separate shrubs; male (pollen) cones 3-6 mm long, arising in the axils of leaves; female (seed) cones berry-like, 6-9 mm long, bluish black, glaucous; seeds 1-3, ovoid to rounded, 4-5 mm long, brown. 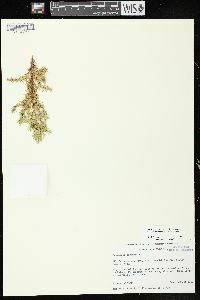 Ecology: Slopes, montane and alpine habitats, rocky soils; 0-3400 m (0-11200 ft); Coconino, Gila, Greenlee, Navajo, and Apache counties; Canada, northeastern and western U.S. Notes: Of the junipers, this species is the most widespread. Ours, as here described, is var. depressa. It is a drought-resistant shrub, but is fairly intolerant of fire or shade. Propagation occurs by seed or bare root, and seeds are stored in the soil seed bank, although germination rates are poor due to after-ripening requirements and defective seeds. Wild ungulates will browse this species, mainly in the winter; livestock rarely eat it. Birds, including turkeys, eat the berries, and it provides good shade and cover for both birds and small mammals. The foliage is resinous and very flammable, and it therefore is often susceptible to fire. However, J. communis can survive fire if it grows on exposed bedrock or on cliff faces. This species is widely used as an attractive low-growing ornamental and for erosion control. It has numerous medicinal uses, but has been most commonly used as a cough medicine and respiratory aid, and for kidney and stomach ailments as well as rheumatism. Lvs in whorls of 3, jointed at the base, crowded, linear, loose or spreading, pungent, 6-18 mm, with a median white stripe above; cones axillary, bluish or black, 6-13 mm thick, mostly 3-seeded. Circumboreal, s. in Amer. to Pa., Wis., Minn., the Rocky Mt. states, and irregularly to S.C. and s. Ind. Nearly all of our plants belong to the var. depressa Pursh, the common Amer. phase of the sp. ; decumbent but not prostrate, forming flat-topped circular patches mostly 0.5-2 m tall and several m wide; lvs spreading or ascending, mostly straight, (6)10-18 mm, the white stripe narrower than each margin; mostly in dry, rocky, or otherwise poor soil; occasional more arborescent specimens, with a ±definite central axis, have been mistaken for the arborescent Eurasian var. 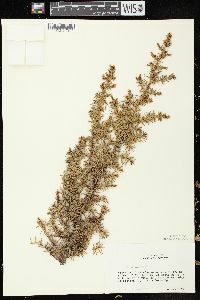 communis, which has the white stripe on the lvs at least as broad as each margin. The high-northern, circumboreal var. montana Aiton reaches only the ne. margin of our range, as on the coast of N.S. and the coast and mts. of n. Me. ; it is prostrate or nearly so and trailing, with oblong, abruptly short-pointed, incurved and imbricate lvs 6-10 mm, these with a broad white stripe, evidently wider than each margin (var. 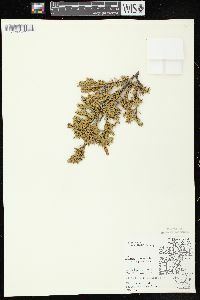 alpina; var. 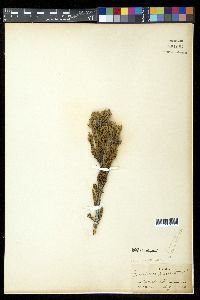 saxatilis, misapplied; J. sibirica; J. nana).